Behold: an incredibly simple, delicious and colorful side dish that will cut through all the creamy casserole concoctions going on your Thanksgiving table. Simple: You don’t even have to peel the carrots. These dutch carrots can be found anywhere and get so tender in the oven a good scrub is all you need. 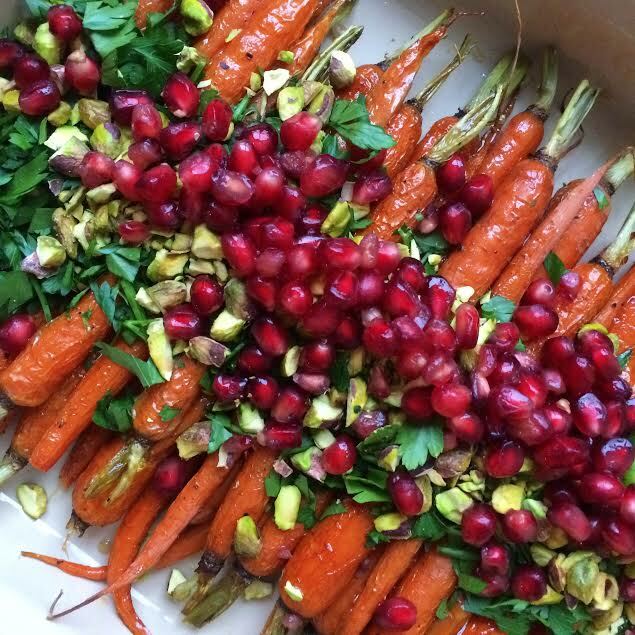 Feel free to roast the carrots well in advance and simply warm up before serving. They are pretty flexible so if you need to adjust the oven temperature a little to fit in with other dishes you have going on feel free. Delicious: How two ingredients (maple+olive oil) can make some humble carrots taste so insanely good is beyond me. Beyond. All the texture and flavor from the toppings sends this side dish over the top. Colorful: Pomegranate arils are essentially food glitter. I love their color contrast with the pistachio and parsley (as can also be seen in my Moroccan Butternut Squash and Goat Cheese Soup with Pistachios and Pomegranate Arils). 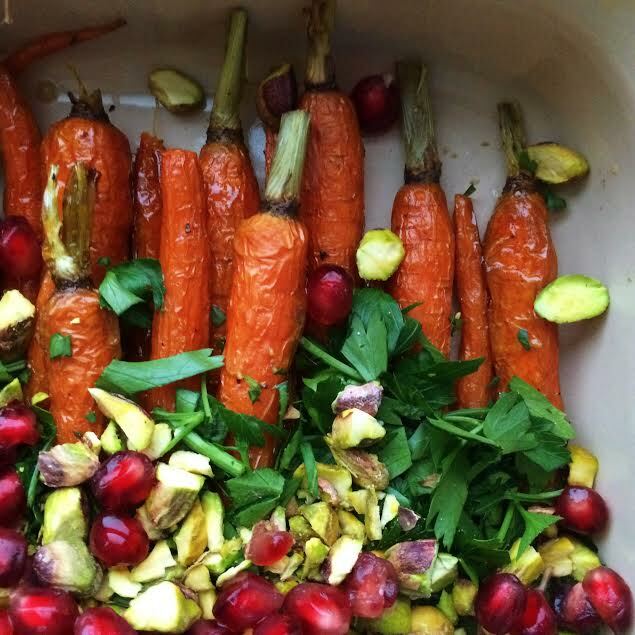 *You could roast carrots in advance and simply reheat and top before serving. Trim greens on carrots and scrub clean. 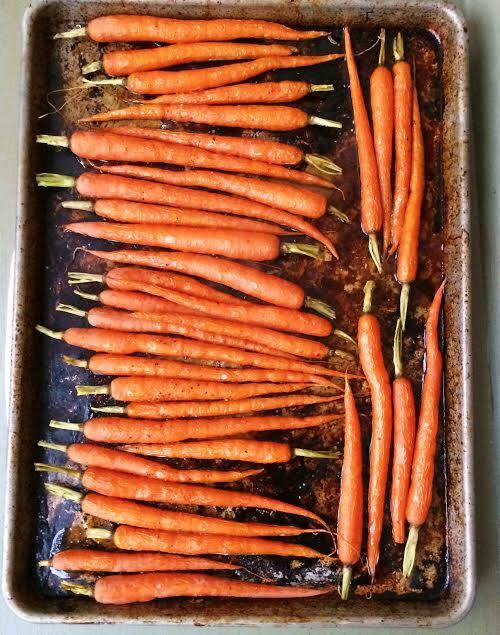 Place carrots in a roasting dish and pour over maple, oil and salt/pep. Toss to coat. Roast carrots for 30-35 minutes until completely tender. 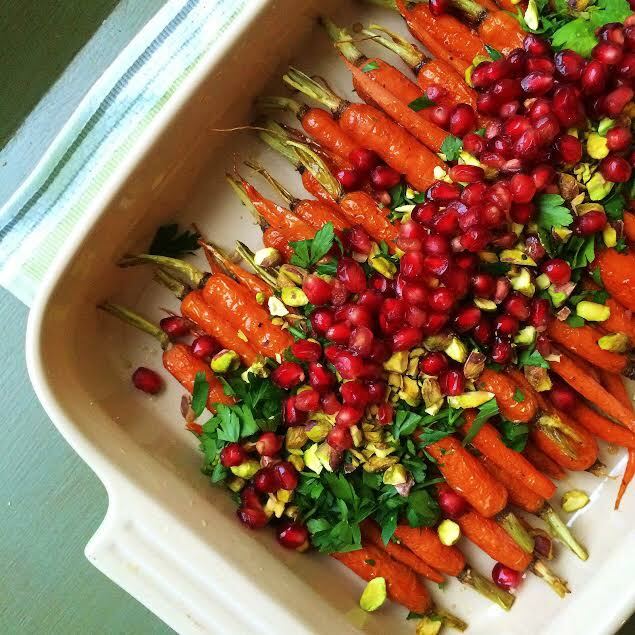 Transfer carrots to serving dish and scatter aggresivvely with parsley, pistachios and pomegranate arils. I love your taste Roxana! !